Background: An efficient, microwave assisted, copper catalyzed synthetic protocol for α- ketoamides has been developed by using secondary amines. Methods: In the synthetic method, the targeted α-ketoamides were synthesized with the help of microwave by reacting secondary amines and aryl methyl ketones in the presence of copper chloride and hydrogen peroxide. Results: α-ketoamides were prepared in good yields (within 10mins) with the help of a microwave irradiation. The reported protocol is ligand free and the yields of the derivatives were modest to excellent. 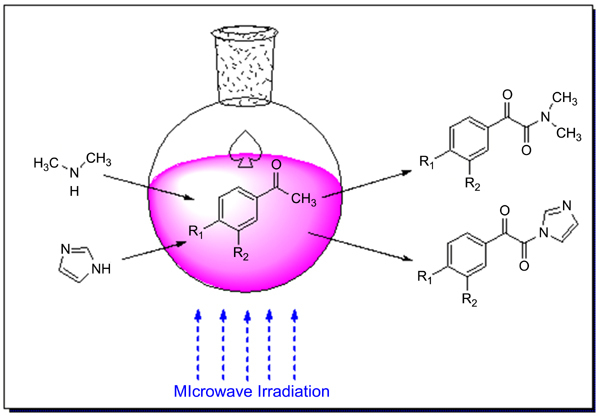 Conclusion: Microwave assisted technique will be a useful alternative method for the preparation of α-ketoamides. Aryl methyl ketones, copper chloride, microwave, secondary amines, α-ketoamides, synthetic protocol.